It's officially winter and everyone seems to be too cold to know who they are, what time it is or what summer ever looked like. And through the foggy mornings and bitty evenings, I still found time to head to the cinema and check out The Greatest Showman. An original musical, tells the rags to riches story of P.T. Barnum (Hugh Jackman), the founder of the famous Barnum & Bailey Circus. The narrative follows Barnum as he recruits a host of 'curious' performers to build a new brand of show business extravaganza, whilst also dealing with his ambition to break into mainstream acceptability as the agent and manager of classical Swedish singer (played by Rebecca Ferguson.) Barnum's divided loyalties strike discord in both his professional and personal life with wife Charity (Michelle Williams), the film works almost like a fable - teaching us to remember and cherish the real blessings in our lives and not getting carried away with selfish or shallow ambitions. So here's the thing: I love the studio's courage in taking chances on creating an original musical in this day and age, but I just wish The Greatest Showman was a little better. For a film that revels in celebrating the more unusual sides of life, the problem is that it just seems to be a little too traditional and perfect for its own good. The film's neatness took away the feel that the film was about the beauty of human nature's grandest curiosities. The film just seems a little too sugar-coated and syrupy for it's own good. You could guess the next scene before it happened - every single character got a perfectly pleasant happy ending. There was a lot of hype about the fact the musical number were written by the La La Land team, but I've got to say that the only truly arresting song was the wonderfully anthemic This is me. The filmmakers must have guessed this as the only song featured in the trailer is this uplifting track. Don't get me wrong, the other songs are enjoyable but only that song seemed to be a real showstopper. 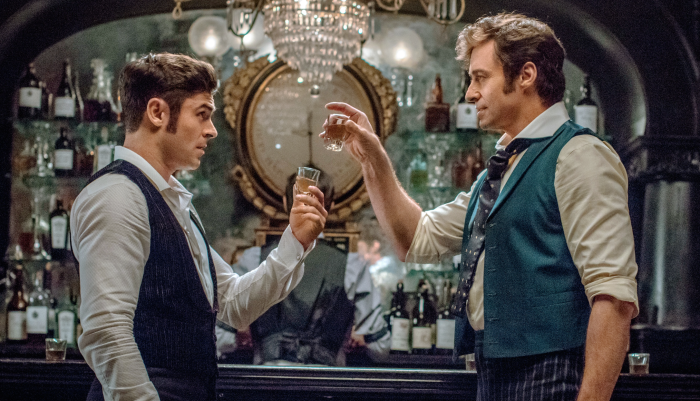 Despite a quirky cast and a grand tale - The Greatest Showman falls a little short of what was promised and most likely intended to have been created. By now, I think we all know that Hugh Jackman is a good old-fashioned song and dance man at heart, he does showcase some of his best razzle-dazzle qualities as P.T. Barnum. A solid set of pipes and a solid presence of screen, Jackman leads the picture with ease. It isn't his most magnificent role - but still a good performance. Michelle Williams is given a rare opportunity to smile in the picture as Barnum's wife Charity. Some of the more poignant performances are given by Zac Efrom as Phillip Carlyle, Barnum's shiny-new business partner, and Rebecca Ferguson as Swedish singer Jenny Lind - both of whom provide an extra boost of star quality to the film. Perhaps the films most pleasant surprise comes in the form of Zendaya, as trapeze artist Anne Wheeler. I must admit, her name appears on my snapchat and my Instagram feed more than in the credits of my favourite films. However, the former Disney star really shines on the screen and displays some impressive acting and singing. Moral issues from racism to sexism are taken on in this film and it does a lovely job of looking into them in a child-friendly, tear-jerking way. Overall, The Greatest Showman is a pleasant enough film without being something that is going to be a life-long favourite. It provides a richer 'family fun' experience than many other offerings at this time of year, but don't expect to be completely blown away.